If ever I am called to go to another town or city for pleasure of for business I try to get out for an early morning walk. For me, it’s the best time of the day. It’s the time before most people begin to move, and the time when the light is clear, the sun is still low, and the air is fresh. 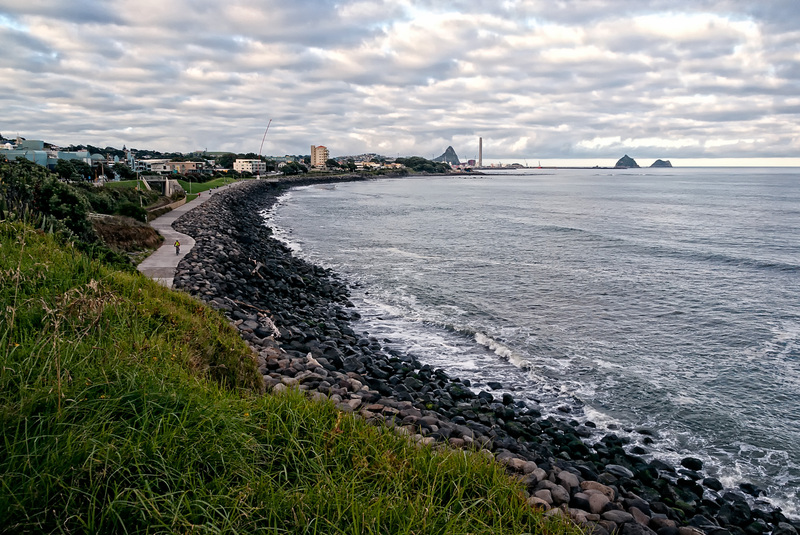 It was on such a morning that I took my morning walk along the coastal walkway at New Plymouth in the Taranaki region of New Zealand. Taranaki occupies that area of the large western cape of the North Island of New Zealand. Its central feature is Mt Taranaki, a Fuji look-alike that dominates the landscape throughout the region. 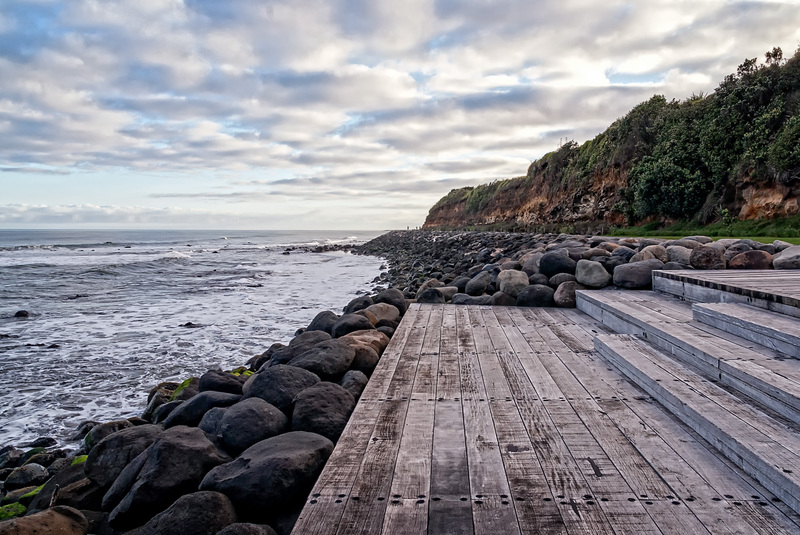 The coastal walkway stretches 11 km from the Port Taranaki, past the New Plymouth CBD, then on around the cliffs and beaches in a northerly direction. It’s popular with walkers, runners and cyclists. Port Taranaki and New Plymouth CBD. The “wand” on the foreshore next to the rectangular white building is an installation art piece designed by artist Len Lye. On this particular morning there was a lovely piebald sky that added to the enjoyment of the walk. This entry was posted on July 3, 2013 by alphathread. 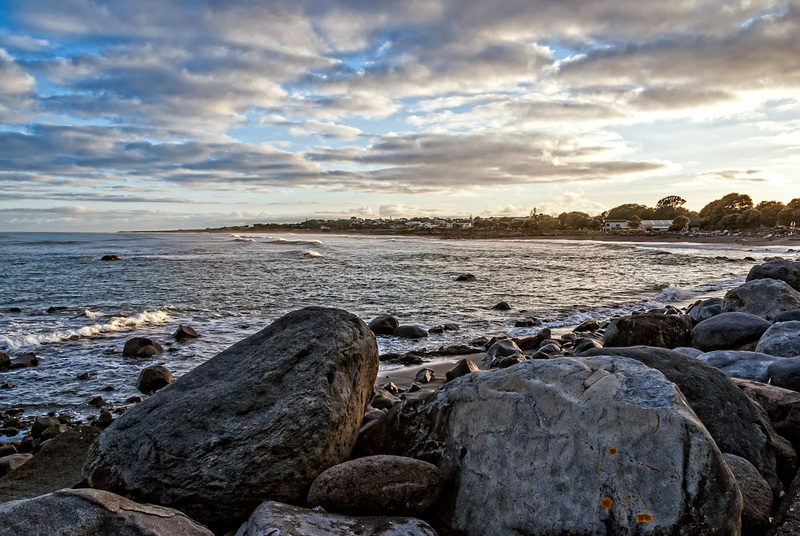 It was filed under Beaches, Buildings, Chris Gregory, Exploration, New Zealand, People, Taranaki, Travel and was tagged with artist, Coastal Walkway, cycling, Fitzroy Beach, installation art, kinetic wand, Len Lye, Mt Taranaki, New Plymouth, new plymouth coastal walkway, piebald skies, port taranaki, Running, Walking. Wow, this is a beautiful area. Not one we visited when we went to New Zealand in 1998. Great pictures. Beautiful Chris :-). We have deer on Kiawah that are called piebald. They are speckled. Is that what you meant by calling this piebald skies?